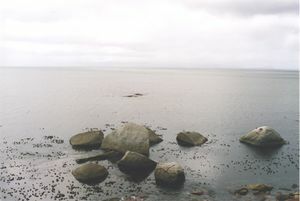 The dive site Stern Reef is an inshore rocky reef in the Rocklands Point area on the False Bay coast of the Cape Peninsula, near Cape Town in the Western Cape province of South Africa. Stern Reef from the parking area at Spaniard Rock. The break in the middle of the picture is on the reef. An extensive area of high to low relief granite corestones on a sand bottom, marked by a rock which breaks the surface at some states of the tide. 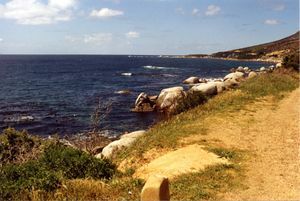 About 260m South of Spaniard Rock, towards Miller’s Point. Maximum depth is about 14m, and the top of the reef breaks surface at low tide. Other rocks are lower. but the bottom is fairly level. Stern Reef on a quiet day, showing the top of the rocks just breaking the surface. Coarse sand bottom with big granite boulders and reef. Largely fairly high to high relief with some low areas. Quite nice, specially just seaward of blinder, with quite a nice swim-through and some deep gullies between boulders. The reef has not yet been surveyed, but is thought to extend at least 50m to the north, east and west of the breakers. The bottom to the south is sandy. Shore diving is limited by entry and exit conditions. Boat dives may be done in bigger swell with more surge, but the site is fairly shallow and surge will usually reach all the way down. 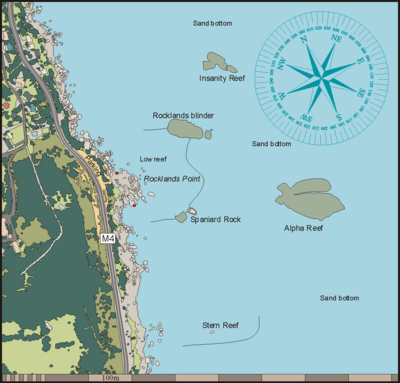 Optional shore dive from Rocklands Point: Parking at side of main road on gravel shoulder. Access not easy and entry/exit a bit rough if there is much swell. Kelp on top of shallower reef areas. Heavy encrustations of red bait and feather stars with a variety of other invertebrates typical of the area. Fairly good site for macro photography. The path from the road is steep and slippery and usually in poor repair. Shore entry and exit are over a boulder beach. No special skills required for boat dive. Some fitness and agility required for shore entry and exit. No special equipment required. A light is handy for looking into crevices and overhangs. A compass can be useful for keeping track of where you are. This page was last edited on 26 November 2010, at 15:02.